One of the tamest and oldest rides at Disneyland is the train. Not only can you ride on it and see a couple of attractions along the way, but it's also an excellent way to get around Disneyland without walking too much. Restrictions: No height or age restrictions. Wait Factor: Medium. This train doesn't have a FASTPASS. Accessibility: Accessibility varies by station. See the notes below. More about visiting Disneyland in a wheelchair or ECV. To access the audio from the Grand Canyon and Primeval World, you can pick up a handheld captioning device at Guest Relations located at City Hall. It takes about 20 minutes to go all the way around the park on the train. Trains are scheduled every 5 to 10 minutes at most times throughout the day. Use it to get acquainted with the park layout when you first arrive, or to rest your feet while traveling between areas later in the day. The train is also the only way to see the Grand Canyon Diorama. Between the Tomorrowland and Main Street, U.S.A. stations, the Disneyland Train passes a display featuring a view the Grand Canyon today and another of the same canyon filled with prehistoric dinosaurs. Like any other attraction at Disneyland, the train or some of its stations sometimes close for maintenance, renovation, or upgrades. To find out, check the Park Hours tab of the monthly calendar page to see what's being worked on. The Disneyland Railroad may also close during the fireworks, especially when it's windy. Main Street, U.S.A.: Close to the entrance, City Hall, Main Street shops and Main Street vehicles. You have to climb a lot of steps to reach the boarding platform. Wheelchairs can be folded and placed onboard the train, but their occupants still have to get up the steps. ECVs must be left at the bottom of the stairs until you return. New Orleans Square: Very close to Haunted Mansion and a short walk from Splash Mountain and Pirates of the Caribbean. Wheelchairs and ECVs can be accommodated onboard the last car. Go up the exit ramp nearest the Haunted Mansion and wait outside the exit gate behind the yellow line for a Cast Member to provide boarding instructions. Tomorrowland: Close to Star Wars Launch Bay, Autopia and Space Mountain. This station is a little bit hidden, but the entrance is reached by walking between Star Wars Launch Bay and Autopia. Mickey's Toontown: Near Toontown, it's a small world and the show Mickey and the Magical Map. Wheelchairs and ECVs can be accommodated onboard the last car. You get to it via a ramp located inside the boarding area (limited space available). Wait behind the yellow line outside the west exit gates for a Cast Member to provide boarding instructions. If your children (or any adults in your group who are releasing their inner child for the day) must start their day by seeing Mickey Mouse, take the train. Get on at Main Street and take it straight to Mickey's Toontown where you can see Mickey in his dressing room as soon as you enter the park. But check the day's schedule first to be sure he will be home to receive you. You can also take the train to get out of the park in the evening. In fact, the train from the Tomorrowland station may be a better option than the Monorail for doing that because fewer people know it's there. The Disneyland Railroad is perfect for kids who love trains, but there are more Disneyland rides that are great for your children. You can see all the Disneyland rides at a glance on the Disneyland Ride Sheet. If you want to browse through them starting with the best-rated, start with the Haunted Mansion and follow the navigation. While you're thinking about rides, you should also download our recommended Disneyland Apps (they're all free!) and get some proven tips to minimize your Disneyland wait time. 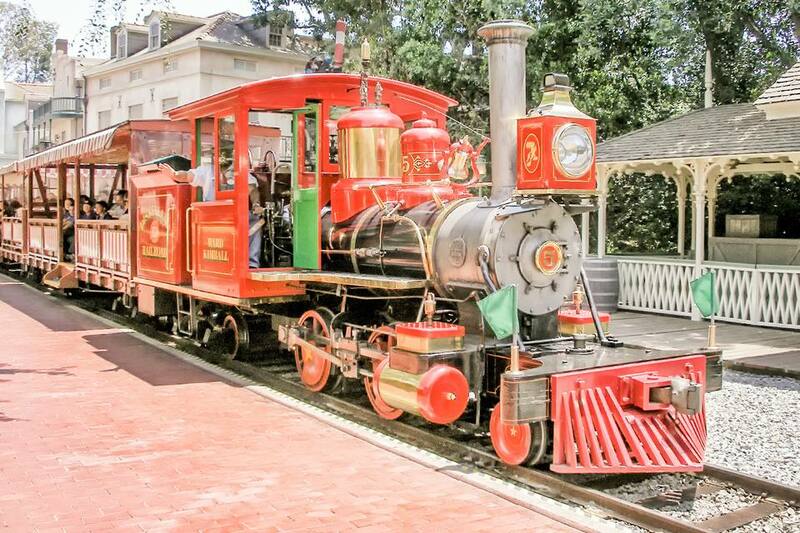 The Disneyland Train wasn't Walt Disney's first. His first was a 1/8-scale train that ran in his backyard, built in 1949. The Disneyland train isn't just one train, but five. Each is a meticulously restored, working narrow-gauge train with four sets of passenger cars. The trains are named for locomotive legends C.K. Holliday, E.P. Ripley, Ernest Marsh, and Fred Gurley. The fifth train is named for Ward Kimball, the Disney animator who fostered Walt Disney’s passion for the railway. Get all the details about the engines at the Disneyland blog. The fancy caboose of the train is the observation car of the original Disneyland train. Named the "Lilly Belle," in honor of Walt Disney's wife, Lillian, it's now a lavish VIP parlor car, with live palms, silk roses, brass fixtures, stained glass skylights, elaborate woodwork and chairs upholstered in burgundy velvet. The original Disneyland train cars weren't scrapped; they just moved north to Santa Margarita Ranch, where they are now part of the Pacific Coast Railroad.